How to deploy Windows Server 2016 TP3 onto an SD card? A few weeks ago I bought a HP Microserver Gen8 (Intel Celeron G1610T, 2,3GHz, 2GB RAM) to continue to use the four 1TB Hitachi HDDs from my previous NAS system and 12GB RAM that are left over from other systems. The main reason for buying the HP Microserver is to play a bit with Storage Spaces Direct and the Scale-Out File Server, but I will talk about this later in another blog post. What is really nice about the HP Microserver Gen8 are the different boot options. I can install my OS onto a HDD, a SSD, an SD card or an USB drive. 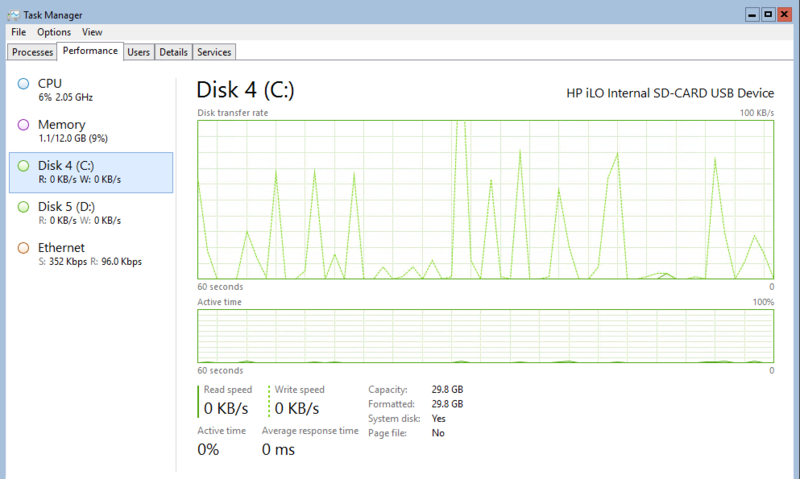 The HP Microserver Gen8 offers me internal slots for the USB drive and the SD card. I have chosen the SD card option and as you may expect I cannot just install the OS through the wizard onto the SD card. Just for your information the SD card size is 32GB. Then I executed the following commands. Make sure the SD card has the drive letter C and the bootable USB drive D or another drive letter than C. Replace the x in “select disk” with the number of the disk which is your SD card! The command “list disk” is your friend. The Windows Server 2016 TP3 image contains four different SKUs which you can choose from. The parameter /index:x defines which SKU will be applied onto the SD card and I have chosen number 3 for the Datacenter Core SKU. After the execution of the last command “bcdboot C:Windows” I rebooted the server and the server runs from the SD card. The final step after the first login is to deactivate the page file to extend the life of the SD card. This entry was posted in Windows Server and tagged Beta, Preview, Server, Storage, Windows on 12. October 2015 by Daniel.